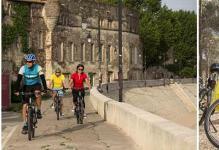 Whether you're a keen cyclist or a novice, we have cycling holidays to suit every level. Imagine a leisurely ride through mesmerising countries with opportunities to meet the locals to following the tracks of the Tour de France. From Asia, Africa, The Americas, Europe and the Middle East - we have a vast range of destinations on offer, both guided and self-guided options to choose from. You set the pace - we handle the logistics!